It had been a while since we had made use of the chupaqueso, so we decided to make some chupaqueso taco salads. We only had mozzerella, however, instead of the Mexican blend cheese we usually use, and it did not crisp up as well as the blend does. It was still tasty, however. We were lured into this Chinese place around the corner by the big sign for a crab special for $11.99. It turned out to be a quite tasty place. The crab was fresh and sweet, but the sauce was slightly gelatinous. The noodles were more sauteed than fried, which was a good thing. This was a satisfying, simple dish. This enormous bowl of soup was really very tasty. The sour came from actual pickled veggies, and while I don't really know if it was authentic, it seemed that way. 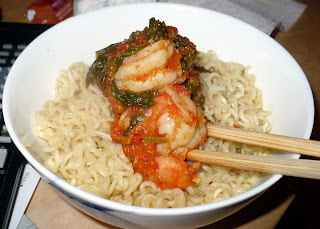 Spicy and satisfying when served with ramen noodles. Puree the peppers, onion, tomatoes and garlic in a food processor. Sautee the puree over medium heat in a large pan in a bit of oil. 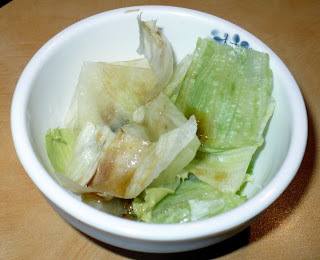 After a few minutes, add the salt, chili paste and mustard greens and sautee until a thick sauce has formed. Add the shrimp and sautee a few more minutes, until shrimp is just cooked through. Serve over cooked noodles. Although I work very close to South Park, I had never been to the Butler and Chef, a French cafe on the park. There were not that many things on the menu that both sounded good to me, and that I could eat, given the restrictions of pregnancy. 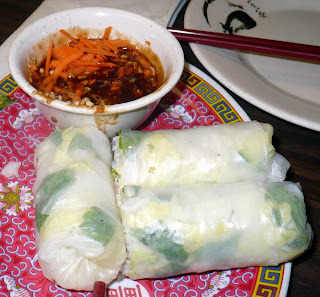 The service was fast and pleasant and the food was decent. 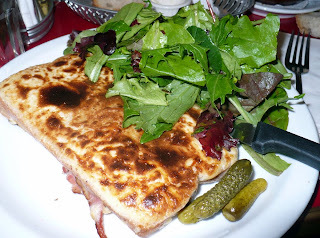 I decided on a classic, the croque monsieur, a hot ham sandwich. It was pretty good, but a bit soggy. The steak is simply marinated in worcestershire and steak seasoning, then pan fried in a bit of butter and oil for approx 4 minutes on each side (for med-rare). The salad is just some lettuce simply dressed in a homemade balsamic vinaigrette. 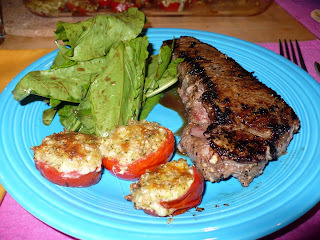 The stuffed tomatoes are a new favorite of mine. 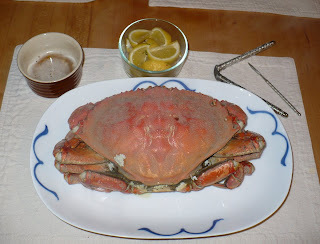 A crab steamed in beer with garlic butter and lemon. 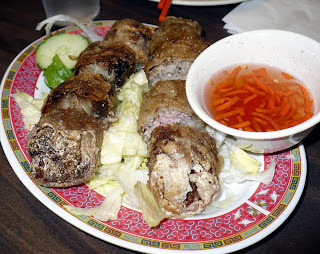 I think this may be Giao's perfect meal. I used to make crepes all the time in college; sweet crepes, savory crepes, all sorts. I haven't made them in a while because we try to not eat too much in the way of refined carbs. However, we were having our neighbors over for brunch, and I've sort of thrown all eating restrictions out the window during this pregnancy, so I decided that crepes would be the perfect bunch food. These were as good as I remembered, and I am still very good at making perfectly round crepes. Whisk all the ingredients together and let sit for about 20 minutes. You want a really thin batter, but one that still stays together. I usually start out with 1 cup of milk and then keep adding a little at a time until I get the right consistency. In a large frying pan, melt a bit of butter over medium high. Place about 1/2 a ladel's worth of batter in the center of the hot, buttered pan and quickly smooth out the batter in outward concentric circles starting at the center until you have a thin, perfectly round crepe. When you can see that the edges are beginning to brown in the slightest (about 30 seconds), flip the crepe. After about 15 seconds flip the crepe out onto a plate and continue the process until all of the batter is gone. 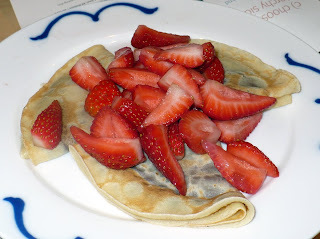 Spread with nutella, fold in half and then in half again and top with fresh strawberries. Irving Cafe and Deli is just a few blocks away from us and while it's hours are a little strange (it closes daily at 6), the food is delicious and it is very cheap. The entire space is about 200 square feet and even so, they do have a few seats at a counter. The ambiance is not great, but the food and prices can't be beat. 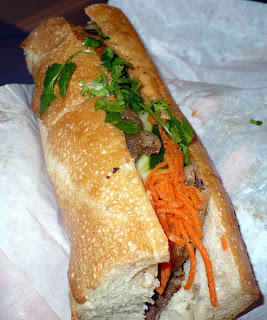 This is the most expensive sandwich at Irving Cafe and Deli and it is delicious and packed with meat. The other sandwiches range in price starting at about $2.50. This is one of the best deals around. 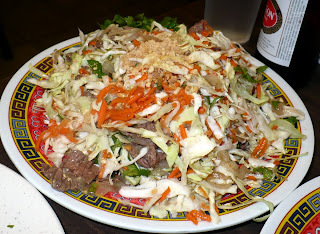 Not only do we love Tu Lan for it's delicious food, we also love Tu Lan because it is so cheap. Our total bill, including a few beers and tax, was $40. That means that the 4 of us were all stuffed with a delicious feast for under $10 per person. This is my favorite dish. 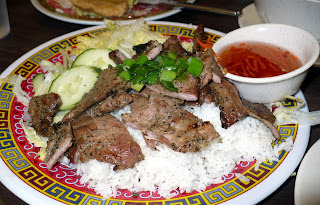 The pork is juicy and flavorful and perfect when dipped in the sweet-sour fish sauce. Cabbage, beef and svaory sauce. Yum. 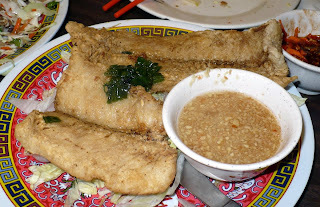 This fish is crispy on the outside and juicy on the inside and the fresh ginger sauce is quite delicious. This soup is one of our favorite dishes. It was a little more gelatinous than usual, but it was still amazing. A tasty way to start a meal. These are bigger than usual and were served without the lettuce for wrapping, which was a little weird, but they were very good. 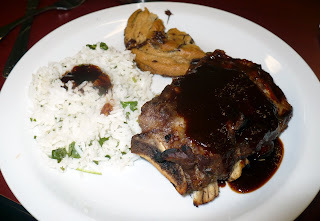 Although we previously have not had good experiences with Asqew, I found that the ribs were actually pretty good. They were juicy and they fell off the bone. The batteries in our camera died before we got most of our food, so you only get a couple pictures. Tofu Village is a Korean place in our neighborhood that we've been meaning to try. It was tasty, but a bit expensive for what it was. These dishes are served free with the meal. 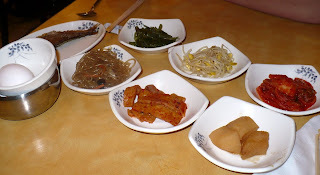 There was kim chee, noodles, seaweed, potatoes, tofu and bean sprouts. Also served free with the meal. Simple and the dressing was a bit too sweet for my liking. The pork was tasty and juicy, but rather expensive, for pork. 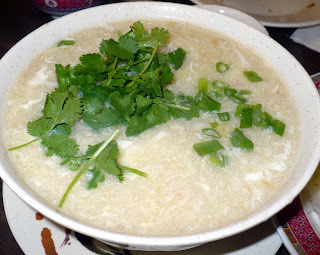 The soup was served with sticky rice and was spicy and satisfying.